Appreciate the help provided by all of the contributors here! I am new to this game – but I have downloaded RoughProfiler to generate the ICC profile to use in Photoshop Elements. I have a Plustek 8100i which came with an IT8 slide, but no reference file to provide for RoughProfiler. Plustek has not responded to my request for a reference file. Is this something that I can obtain from a 3rd party? I figured out the process shortly after posting . . . the IT8 reference is provided by LaserSoft. On LaserSoft’s website, there is a table of reference files referenced by a number prefixed with “E” that’s on the IT8 slide. I downloaded that file and used it in Rough Profiler. So now I’m creating the ICC – I’ll report back on my experience. Since my last post I find some answers, some good, some not as good. 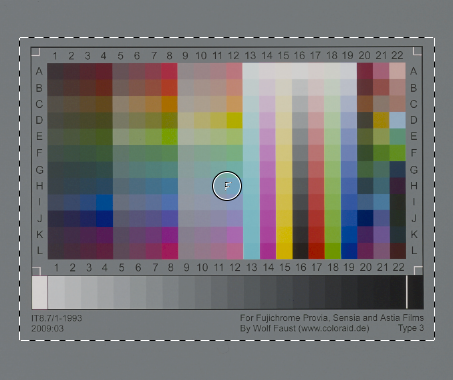 First: It seems that IT8 targets are not suitable for profiling color negatives since every film stock has its own color cast. Bit dissapointing but no big deal. Second: An important one. VueScan does some color conversion when selecting ‘Output Color Space’ other than ‘Device RGB’. For profiling this is specially important, because I guess it makes no sense to profile on a somewhere-in-the-way altered output basis. You would assume that Vuescan means RAW when it says RAW, but it turns out that only “Device RGB’ its the real deal from the CCD. 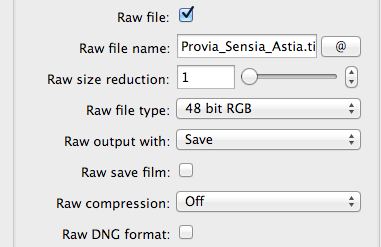 This is a big thing for me since I already scanned lots of color negatives setting ‘Adobe RGB’ as the output color space… I would have preferred to use ProPhoto given the chance later when soft-editing. So: I think that Ian’s method it’s as good as it gets, but we need to scan the targets (and everything from that point) in ‘Device RGB’ to get a realistic profile and get good color correction when applying it later on to other scans obtained in the same fashion. Here I am again this time to bite the bullet… I was wrong! My scanner was taking ages for the lamp to warm up every time I sat in front of the computer to test this, so I was getting messed up readings as I was trying different ‘Output Color Space’ options. It was the lamp shifting colors along the way, but once it was fully warmed up, the scans were all looking the same no matter what color space I selected. I got in contact with Ed Hamrick (VueScan author) on the issue and he indeed asseverated that color in RAW files is never altered by this option. 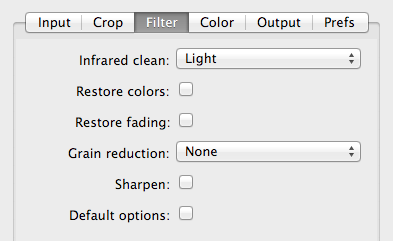 Sorry for the false alarm… I’ll remember to fully warm up the lamp next time as a 1st step in my workflow!! First off – congratulations on your excellent article, which helped me understand much better how to use Vuescan. 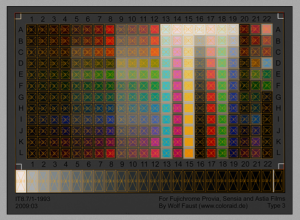 I have now downloaded RoughProfiler2 (for Windows) and successfully created new scanner profiles for my Epson 4990 from the 35mm slide targets (Provia, Ektachrome, etc) I bought from Wolf Faust (www.coloraid.de). The only thing I’m unsure of is: do I need to do anything with the diag.tiff and .ti3 files which are also created? When I open the target RAW-TIFF in Photoshop and apply the new profile it all looks fine. 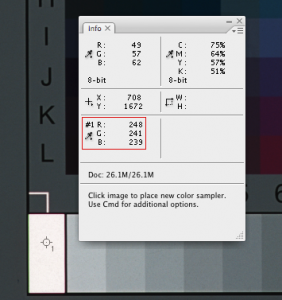 However, because RoughProfiler2 generates ICM profiles (and not ICC) it is important in the Photoshop Colour Settings to set the Conversion Options – Engine to Microsoft ICM. So far so good. But that’s as far as it went for me. Let me explain why I’m doing this. I’m a mountain landscape painter and make 4×5 inch slide copies of my work, from which I make digital prints in various sizes. Accurate colour reproduction is therefore important to me. To assist in this I always include a Kodak Q13 grey scale and a colour patch strip of the colours I used in the photo of the painting. These provide an internal calibration standard which allows me in Photoshop to correct the tonality and remove any colour cast. But it’s a time-consuming business and I have the impression that the colours lose saturation, so I’ve been trying to find a reliable way to get better results. So, all excited with my new ICM profiles, I started scanning my 4×5 inch slides, only to be seriously disappointed with the results, which were much to dark and contrasty with colours way out of balance. Whatever I did with exposure locking and adjusting, re-profiling and different colour spaces, nothing helped. Then I noticed that the exposure values kept changing with the crop area and it occurred to me that maybe my 4×5 slides are simply not compatible with profiles generated from the 35mm targets. Then I read in the Photo.net forum (http://photo.net/digital-darkroom-forum/00d6Fn), that indeed cropping changes the auto-exposure levels. I suppose I’d noticed that before but not realised its significance. 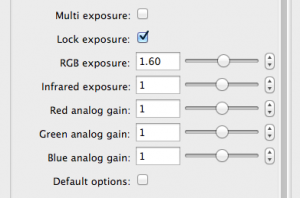 Not only that, but it was stated that the way to really freeze the colour settings you want, is to set the Exposure Lock ON, the Lock Film Base ON and the Lock Image Colour ON. 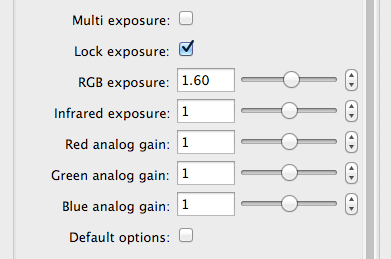 The latter two are parameters that only appear in the control panel when the Exposure Lock has first been set; something which I had never done before and therefore was totally unaware of. All this made me rethink whether it really is necessary to generate new ICM profiles, save only the RAW files from Vuescan and add the profiles in Photoshop. Maybe, using the scanner profiles generated by Vuescan itself and a suitable “Crop & Lock” workflow, I could indeed get good results with TIFF files directly. After some trial and error, I found the answer is YES, YOU CAN! My Q13 greyscale and colour patches proved crucial to establishing the technique, but are probably not necessary for general use. 1. 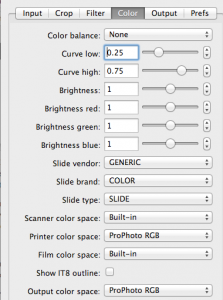 Make a set of scanner profiles using Vuescan and the various 35mm film targets. 2. 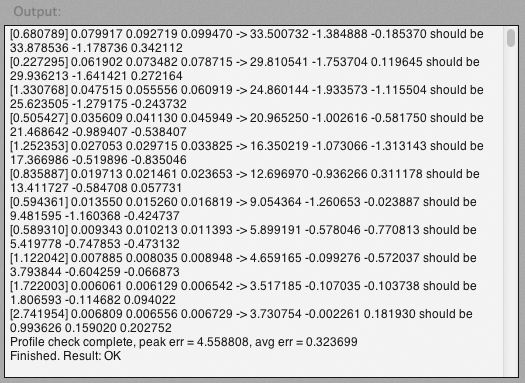 Set the normal scan parameters (resolution etc. ), including the scanner profile, TIFF output, etc. The results are better than anything I’ve got before, although some post-processing of tonality and colour saturation in Photoshop is still necessary. So I’m now a happy Vuescan user and hope this helps anyone else who had problems like I did. Thanks to Ed Hamrick for pointing out that locking the film base colour requires the crop area to contain only pure white, ie. the blank film base. Now the results are even better with less adjustment necessary in Photoshop for the colour saturation. I would like to echo what others have said; this article has uncovered a lot of points that were unclear and confusing to me up until now with respect to scanner profiling, and scanning with Vuescan in general. One thing this article does not answer however, and which was my initial motivation for profiling my Epson V850 scanner, is how to create a “baseline” or default ICC profile to get neutral scans of old photographs, documents etc., in short anything for which no dedicated IT8 target exists. Through my many feeble and frustrating attempts, I have come to the conclusion that there is no way of doing that (please correct me if I am wrong). I initially profiled my scanner in Vuescan with the transparent IT8 target that came with it (MONT45.2015.01). While I had the intention of profiling the scanner with the reflective IT8 target that was also included (MONR2015.03.01), those attempts failed as I couldn’t get any of the ICC profilers that were available to me to accept the corresponding MRF reference file (it turns out that an MRF file is a zipped TXT reference file, d’oh). After months of exclusively scanning negative film, I discovered when scanning photographs that my scans had a distinct blue tint (i.e. the scanner’s lid appeared roughly like Hex #EAEDF4, a light greyish blue). Now that I am profiling using roughProfiler (as explained in this article), the rather strong blue tint is gone, but my scans still have a washed-out metallic blue appearance. The punchline is this: today, when I went through the many different ICC profiles I created over the last months in Photoshop, to see again the results they produce, I found that there are Epson-supplied ICC profiles in the Profiles folder that appear to have been installed when I first set up the scanner: ‘EPSON Perfection V800/V850 – film’ (PERV800F.ICC), and ‘EPSON Perfection V800/V850 – reflective’ (PERV800R.ICC). While the ‘film’ profile still has a slight blue cast, the ‘reflective’ profile comes very close to the physical photos I have tried it with so far. What is really beyond me in all of this (coming back to the beginning of my comment): how are IT8 targets created on (and for) specific film/paper supposed to produce neutral scans across the board? The blueish cast I am seeing when profiling using those targets is probably part of the very characteristic of that film/paper (the paper target is labelled as Kodak Endura; the film target is on Kodak Ektachrome according to the reference file). Or am I missing something here? After some more playing around I can say that I get consistently good results (even with colour photographs) with yet another profile that seems to have been added during the scanner installation: ‘EPSON Standard RGB – Gamma 1.8’ (I’ve uploaded a copy here: http://dropcanvas.com/0vcxp). I would say that colours are 95% there (comparing my scans with how the physical photos look to my naked eyes), and the slight difference could well be in my laptop’s display (calibrated, but it is only a laptop display after all). 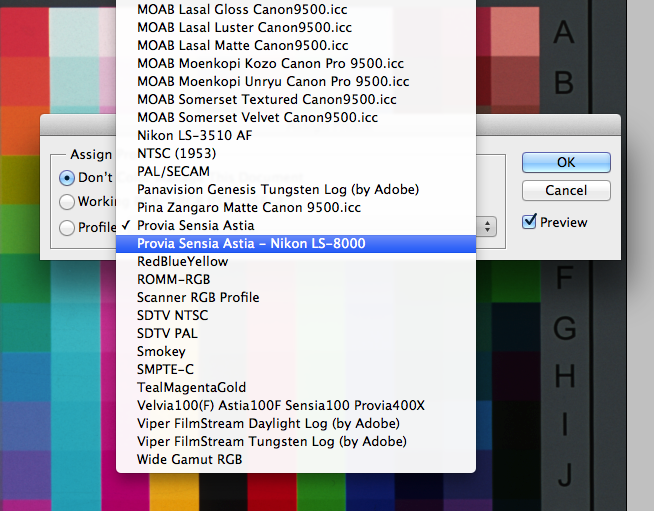 However that Epson profile seems to be based on sRGB (if that makes sense), at least it looks that way in MacOS’s ColorSync Utility. So it would appear that by applying the profile to scans in Photoshop, I am clipping colours to the sRGB colour space. Surely there has got to be a better way? Sorry, I scan the IT8 Target Velvia 50 Wolf Faust with VueScan. I followed step by step instructions and I got a file “name-raw + .tif” and “Name.tif” file. 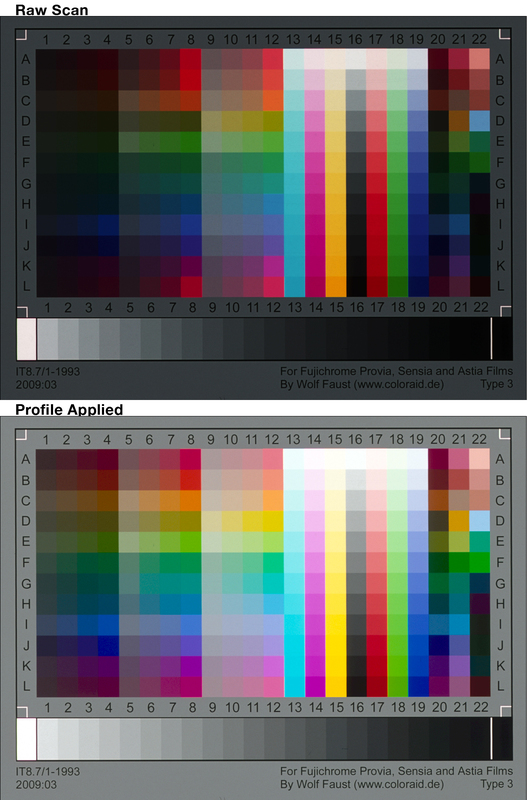 I used Rought Profiler according to the instructions; I put the file “Name-raw + .tif” and the file “* .txt” Wolf Faust. I got the ICM file “Name.icm”; I also got a file “name-raw + .ti3 than not know what is. I followed the instructions to install the ICM profile in windows. 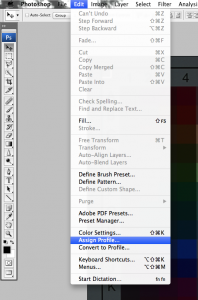 Then I opened Photoshop; I opened the file “Name-B + .tif”; I assigned the profile “Name.icm”. I got a file with the colors completely altered. I repeated the operation several times, but the result is the same. Excuse me, I have a problem with the scanner profile. I followed the instructions to scan the IT8 Target Velvia 50 (V160501) Wolf Faust with VueScan and I got a “Name-raw files + .tif” and “Name.tif” file. 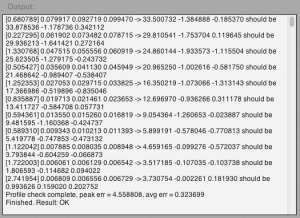 I used Rought Profiler (for windows) according to the instructions. I entered the “Name-raw files + .tif” and the Wolf Faust “V160501.txt” file. I got the ICM profile “Name.icm”; I also got a file “name-raw + .ti3 than not know what good (?). And I entered the ICM profile in windows. 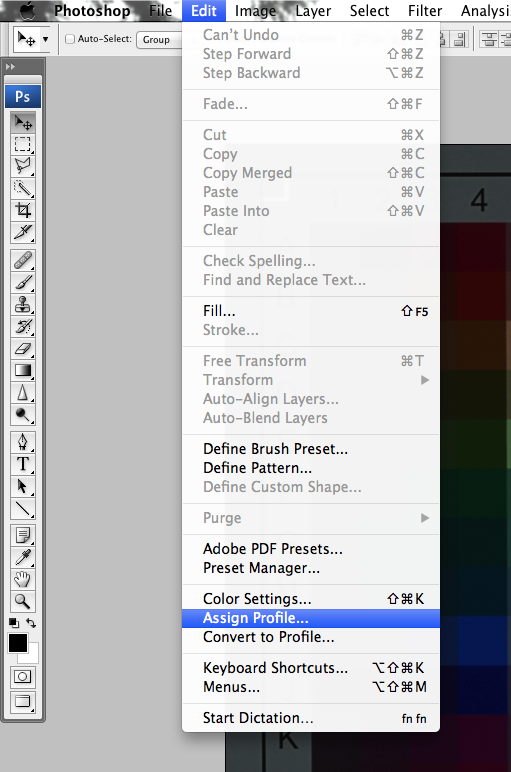 Then in Photoshop CS6: I opened the “Name-B + .tif” file; I assigned the profile “Name.icm”. I got a file with the colors completely altered. I am about to go down the route you describe here as I prepare to calibrate and profile my Epson V600 with Vuescan so I can scan and archive several thousand family prints and film strips. I emailed Wolf Faust to ask what materials I needed to profile, He was nice enough to suggest several IT8 targets and referred me to your Blog here. I am keen to know if there has been any further development in your suggested steps to profile our scanners to deliver accurate color to our photo editing software mainly Photoshop. 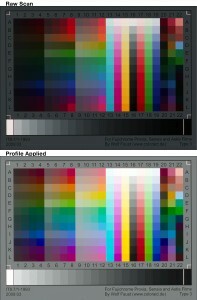 Secondly, will Adobe Lightroom work instead of Photoshop to install the ICM profiles and edit the images? As far as I know, Lightroom is not capable of embedding profiles. 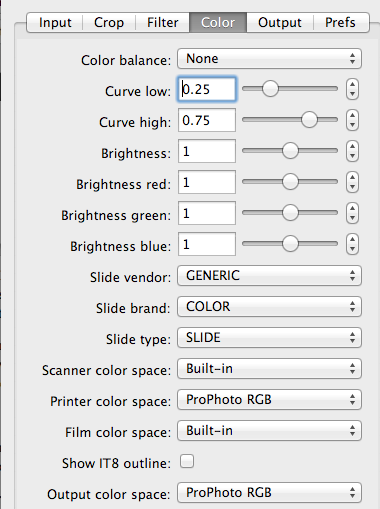 To make the process easier, create an action in Photoshop with the proper profile and then batch process your files. At the moment I don’t have any additional information/steps. That may change in the future. Though the additional information will most likely be a deeper knowledge of profiling than practical steps. Vuescan allows the user to save RAW files as either a .RIF or a .DNG file extension. The .DNG is the Adobe file format extension so isn’t this the preferred way for a user to save a profile if they plan on using Photoshop to edit the image files? Also wouldn’t saving the files in 64 BIT be the preferred method to save the files rather than 48 BIT as it will include the 16 BIT IR channel data used for saving ICE functions such as dust and scratch removal? Hello all, this is the post that helped me to make the best aproximation to a nice negative scan! !